humorous lines by Jerome K. Jerome. Kit Price – £20.50 £9.95 last one ! 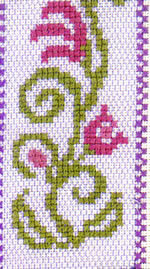 The gauze is attached to the evenweave with a row of simple cross stitches. The corners are overlaid to create an exciting colour blend. 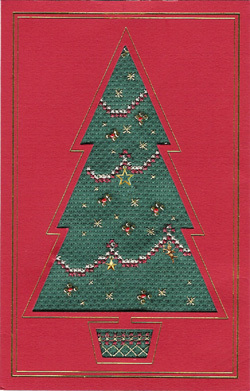 The cross stitches are made through both fabrics. The process is not difficult and has great visual impact. 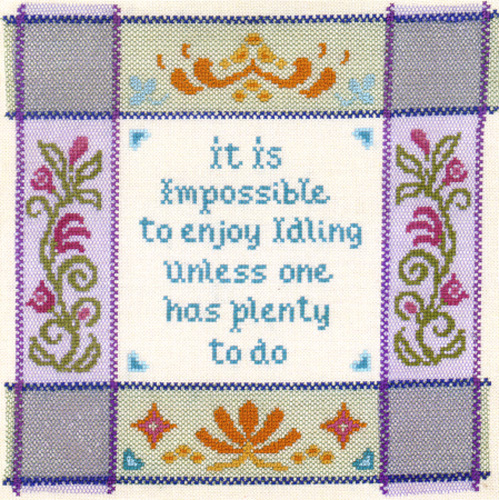 The Enjoy Idling Sampler cross stitch kit has only top quality materials – Zweigart fabric, DMC thread, gauze, needle. The pack has full instructions with cross stitch basics and tips for fine stitching and a clear symbol chart. As a personal finishing touch there is also a completion slip for you fix to to the back of your work with your name and date.